John Lennon and Paul McCartney once wrote “Can’t buy me love, no no no, no…” but we beg to differ. 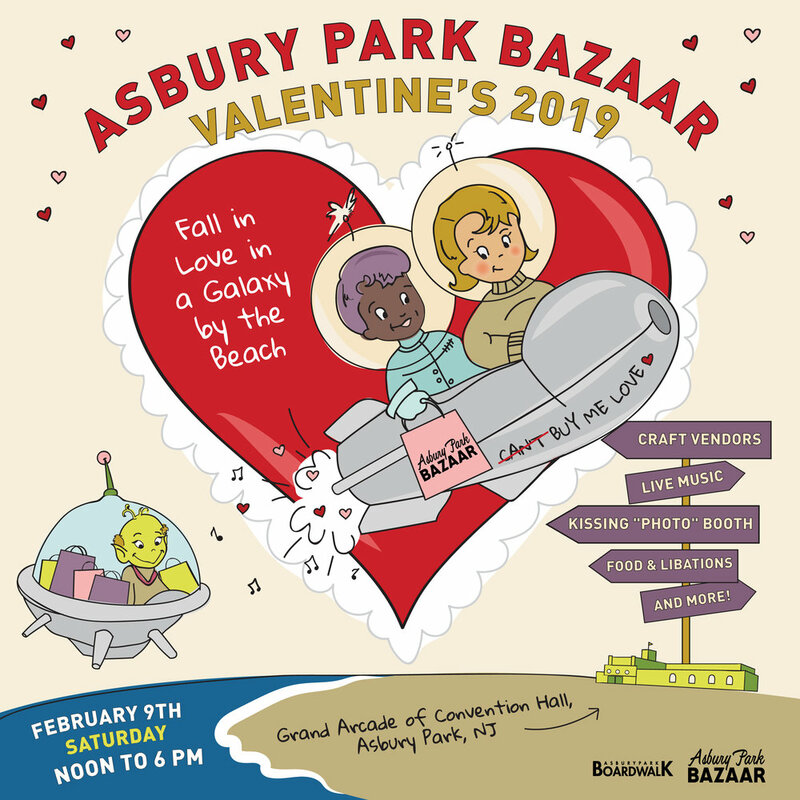 You can buy love - and lots of it - at the Asbury Park Valentine’s Bazaar happening Saturday, February 9th, 2019 from noon to 6 pm in the Grand Arcade of Convention Hall! We’ve curated a special selection of vendors who handcraft goods made with love … every item is handmade, unique, independent, or vintage! Stop by the Bazaar to treat yourself or pick up a perfect Valentine’s gift for someone you love. By supporting Asbury Park Bazaar and our vendors, you are supporting a small business economy that makes our community thrive. Sounds like a match made in heaven to me! So grab your Valentine and head down to the Grand Arcade of Convention Hall on Saturday, February 9th from noon to 6 pm. We will have handcrafted & vintage gifts galore, flowers, chocolates, live music, food & libations, photos, and more. There is really something for everyone of all ages. You can bring a date or come single and mingle! Apparel - Atavist Apparel, Dead Seagull Clothing Co.
Faye and Renee create absolutely stunning floral designs. Their display is breathtaking, and you can pick up a gorgeous flower bouquet and even customize your own! Don’t miss them at the Asbury Park Valentine’s Bazaar on Saturday, May 9th. Slowey and The Boats will perform at our “Lover’s Luau” Brunch hosted by Hi Tide Recordings and The Anchor’s Bend. Enjoy instrumental Hawaiian, swing, and a few tangos, while relaxing with a cocktail and special brunch menu at The Anchor’s Bend. Champagne and oysters, anyone? Stop by the Asbury Oyster Bar, an adorable restaurant inside historic Convention Hall. Their menu features a curated selection of shellfish, fine cheese and wine, charcuterie, full service cocktail bar, and more! And to remember how much fun you had stop by The Little Detour Photo Booth and Lounge for a photo with your partner or pet! Little Detour is NJ's first traveling photo booth camper available for weddings, parties, and events. Family owned and operated in Wall, NJ by owners Amy and Mike Leslie. What’s even sweeter is that a portion of proceeds will benefit our non-profit partner See Spot Rescued, a 501(c)3 all volunteer, foster-based rescue in Jersey City, NJ. Show your love for animals this Valentine’s Day and stop by their booth. Learn about their pet adoptions or donate to help pets in need! When you’re exhausted from all the shopping you’ve done, take a break at our cozy fireplace lounge and hot drink bar - enjoy a selection of hot drinks including hot toddies, hot cider, and hot chocolate (spiked or not-spiked). Fall in love in a galaxy by the beach! See you at the Asbury Park Valentine’s Bazaar in the Grand Arcade of Convention Hall on Feb 9th.